What’s content shock? It’s a term coined by Mark Schaefer two years ago, when he observed that “content supply is exponentially exploding while content demand is flat.” The logical consequence of supply continually outstripping demand is that on average content articles will get less engagement. This harsh reality is confirmed by our analysis of 1m articles in a research project with Moz. When we say less engagement, we really mean it. 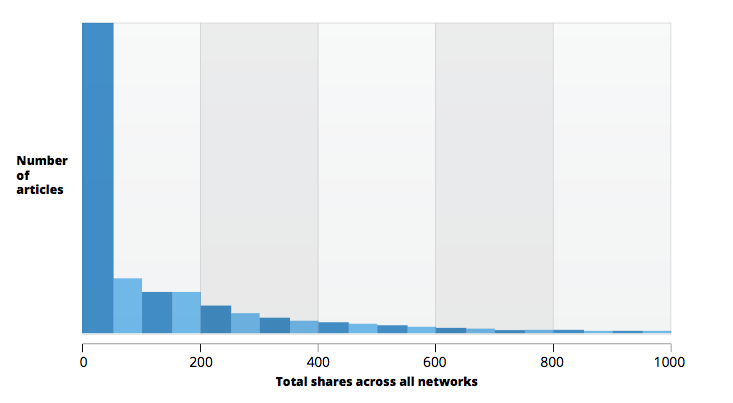 We found that 50% of articles get 8 shares or less and even fewer links. No two ways about it, that’s tough. We take a detailed look at the issue of content shock, why content fails and what you can do to improve your odds. That last stat again: 3 in 4 posts got zero referring domain links. Shares are easier to achieve but even so, most content gets very few shares, as can be seen from the chart below. The chart is cut off on the right at 1,000 shares, in reality it stretched out to over 100,000 shares for some articles. Our research explored the shares and links by network and by content formats. We also looked at the correlation of shares and links, and at the content that achieved both high numbers of shares and links. Our research findings are consistent with recent research by Trackmaven that found 42% of professionally marketed blog posts receive less than 10 interactions. The findings could simply mean that people are producing poor content which is not worthy of sharing. Are we all really that bad? However, I suspect this is not the case. Whilst in earlier years it was possible that if you produced good content it would get found and shared, almost by virtue of its quality, this is no longer the case. There is now so much content that even producing great content is not enough. The bar is way higher. Popular sites with great content are also being affected by content shock. Buffer recently published a very open and honest post, with all their normal transparency, that highlighted they had lost 50% of their social traffic. And it’s not because Buffer decided to start writing poor content. It’s the ‘content crush’ as they call it. There may be more similar content but fundamentally there is just too much other stuff out there. Also what worked last year may no longer work this year, we all have to keep testing new content and adapting. And it’s not just Buffer. We analyzed the average shares per content item published on Buffer, Socal Media Examiner, Moz and Copyblogger. The results surprised us. All the sites have seen a decline in the average shares they achieve as we can see below. We saw a similar decline on average for all content published on Moz but the shares just for their own Moz blog have remained constant, they have multiple blogs and content. No one would argue these are not great sites, arguably they are actually exemplar sites when it comes to content. However, they are not immune from content shock. In our analysis sites have increased their content output and in the case of CopyBlogger this has resulted in more total shares than last December but significantly less per post. This is consistent with Trackmaven’s recent analysis of content from 8,800 brands over the last 24 months which found the output of content per brand increased by 78% but average content engagement decreased by 60%. Thus the cost-effectiveness of content marketing appears to be declining. What is clear is that producing great content is not enough on its own to drive views and engagement. Content shock clearly affects everyone but unfortunately we are seeing common mistakes made by content producers that compound the problem. One of the common mistakes we see is rushing into content production without enough research. There is a lot of pressure on content teams to produce content consistently, so we understand why this happens. However, the battle for content engagement can be won or lost at the research stage, before any content is even written. There is no magic wand but if you understand the content that resonates with your audience you have a better chance of increasing engagement. If you know the content your audience likes, shares and engages with, you can develop content that your audience will engage with and share. You can produce the best post in the world how to market to organic crop farmers in Somalia but if your audience is not interested in that topic you are wasting your time. Your odds are greatly improved if your content answers the questions your audience is asking. Your support teams and sales teams will have good understanding of questions your customers and potential customers are asking. Identify these questions and as Lee Odden says “be the best answer”. Research also includes understanding what competitors are doing and the content that is working for them. You can start your research with a search for the most shared content on your topic using BuzzSumo. Most people look at the top content for the last year but it is useful to undertake analysis for the last month. For example, is the nature of content changing, what formats are working or not working, are certain networks becoming more important, etc? Is last month just a one-off or are you seeing new trends? Below is a quick analysis for “content marketing” articles and sharing over the last month. Feed your research into your content plan when assessing content opportunities. One of the most disappointing things we see again and again is good content that was produced with no amplification strategy. You’re doubling down on your time-wasting. You cannot assume that people will find your content or that people will share it. It’s hard enough for people to keep up with the content they desperately want to see, never mind your stuff. Before you create your content you need to understand how it will be amplified. Who will share it or link to it and why? The reality is that you need an outreach strategy which is hard work and takes time. 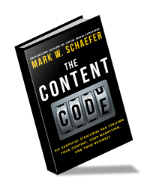 Mark Schaefer has highlighted the importance of what he calls content ignition and Eric Enge has emphasised the importance of content promotion. It doesn’t matter what you call it but you need to be clear how your content will get in front of people for them to engage with it. Social networks are increasingly important in content discovery. According to Shareaholic social networks are now the biggest drivers of discovery and traffic, more than search. Of these networks the most important is Facebook which alone drives over 25% of web traffic according to Pars.ly and Shareaholic. As a minimum you need to understand how successful content gets amplified. Who shares it and links to it? How can you get them to do that for you? Also how important is paid distribution. Organic reach has fallen so low on some of the social networks that you will need to pay to get content amplified. Buffer has publicly said they’ll be trying more of this. You need to be spending at least as much time on amplification as on content creation because we are sadly moving to a situation where amplification arguably matters more than the quality of content. Thus those with the best amplification strategies or the deepest advertising pockets may win out over quality content. Also do not believe that gaining lots of content shares will lead to links. Our research proved this to be a false assumption. People share and link for different reasons. Whilst there are areas of crossover to gain links requires content that has inherent value, is often long form, comprehensive, authoritative and evergreen. To gain links takes time and a determined link building strategy. It’s not a byproduct of social sharing. Another mistake we see is a lack of monitoring and simply not tracking trends. From our analysis we can see that social sharing typically takes place very quickly, an article can explode in terms of social sharing but then die after a limited period of time. New industry announcements, reports and articles can all create short term peaks of interest. If you act quickly the trend is your friend. However, if you join the party at the end of things then you may find yourself all alone without a dance partner. You can see this problem in microcosm in the people who schedule social media posts for later in the week about today’s hot topic, not realising that by the time their post is shared people will have moved on or even be bored by the articles that are engaging them today. 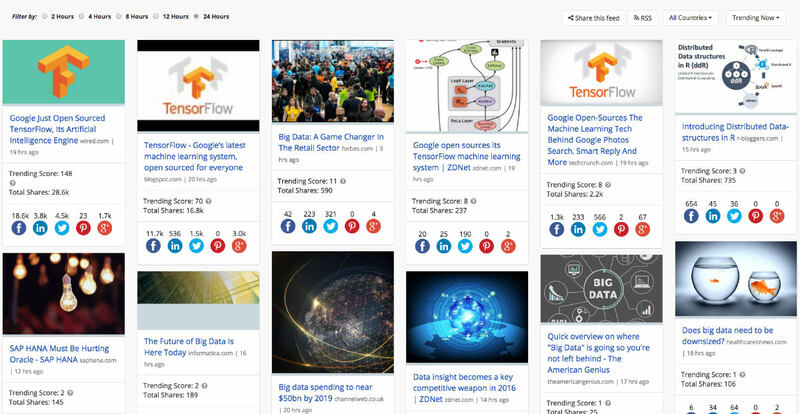 Below are the articles trending on Big Data as I write this post. Google’s open source release of its Artificial Intelligence engine is the trending topic. Maybe there is an opportunity for me to get involved by sharing relevant content, asking my audience questions, interviewing experts for their views or being one of the first people to use the tool and creating a case study. Shares happen much faster than links and it is essential that you keep on top of the trends and issues engaging your audience. Eric Enge highlights the importance of early mover advantage in his thoughtful post on surviving content shock. So if 50% of content gets 8 or less shares and 75% gets zero links, what should you do? There is no easy answer to the issue of content shock and the challenges are almost bound to increase. However, you can do a lot to improve your odds through research, amplification and monitoring. Quality is still vitally important. But you have to give your quality content every chance of succeeding. 8 shares are good too, i didnt get more than 5 likes on my fb profile. lol. 8 or fewer shares, ok. But what happens after those shares? No one talks about that. It’s time we moved from the numbers game to valuable actions. You never know who does what. Hi Cendrine, that’s a good point. What ultimately matters is achieving your goals such as conversions and revenues. Shares, links and traffic should all help but fundamentally you need to measure what matters to your business. Most of us would settle for less shares but more conversions. Thank you @cendrinemedia:disqus I completely agree with your comment. The “8” shares may have reached hundreds or thousands of the most valuable/profitable customer. It’s like caring about the bouncerate on your lead conversion page. This is a fantastic article too. This is a great point. But the article is grounded on the concept of “content shock” in relation to lesser shares and traffic. Hopefully, someone can quantify the sales figures that the content brings to business despite the content shock. Great article. I think the point about declining organic reach on platforms such as Facebook is important. I’m increasingly turning to boosting posts to reach our own audience. Interviewing experts is also an invaluable point, as influencers they can share your article with their own, engaged, followers and offer more original insights- it’s something I regularly do for our own site; especially as I wouldn’t qualify myself as an expert. Is there any way to track the type of device users used when they shared content? That is, is there a way to track whether users on mobile devices shared more or less than those on a desktop or laptop? Also, did sharing include shares via dark social (i.e., sharing via email, SMS, IM)? Hi Chad, unfortunately our data set did not include information on the device people used to share though there have been studies on this and I will try to dig them out. We didn’t include darks shares ie people pasting links into an email, which will mean the shares are potentially underestimated. Great post! Regarding your research around the total number of shares across several sites – did you use Buzzsumo to analyse that data? 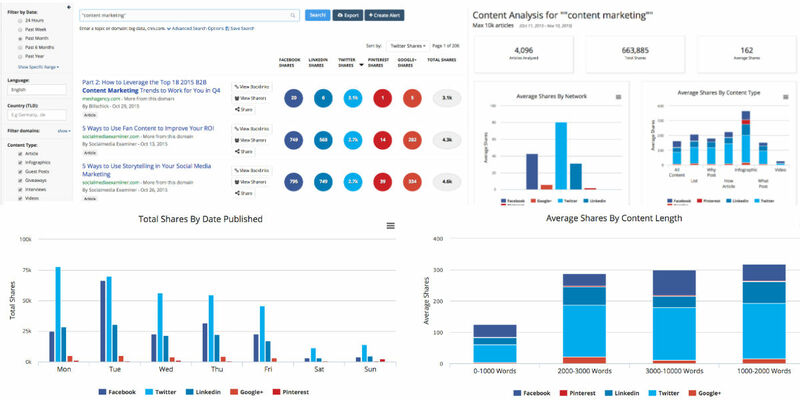 Hi Gemma, we used BuzzSumo share data and Moz link data to analyze the 1m posts in the report. We took posts from 600,000 different domains. I would argue that most content generators are pushing out far more pieces of content than necessary and most of it is – at the end of the day – 500 word or less vague or generalized pieces. You hit the nail on the end with the note about authoritative long form evergreen content getting links- it’s also that type of content that bolsters brands, is good for SEO, creates relationships and is worth sharing. It’s also usually the kind that drives conversions. The problem of too much content can be easily stopped if everyone stops producing so much content just for the sake of it. Hi, thanks for the link. They make some really good points. The key one is about your audience and targeting a very specific audience, which is really my research point. They also argue that more content makes people feel empowered rather than overwhelmed. I think this is true but it doesn’t necessarily help content marketers. They also argue there are better filters to help people sift and discover content, this is also true but interestingly more content is being discovered through social networks and what is being shared, more so now than using sophisticated search engines like Google when it comes to news and recent articles. I hope for all of our sakes that what really matters most is quality content and Joe is optimistic that quality content will rise to the top. I hope he is right but I think you will still have to focus heavily on building your audience and amplifying your content to reach them. Good pointers. What I do not see in the research is the content strategy and mix of Content format (Blogposts, Infographics, Videos, Podcasts/Audios, Webinars etc.). You need to find what content format works well to communicate with your target audience for your business. With limited experience as a practionioner in content marketing, you need to carve a method that works well for your business. You need to tell your story well and it should be authentic. This requires a holistic approach. If you can drive good traffic to website, then the next challenge is how to implement effective CTAs with offers to target audience for conversion. The idea is to create a community of brand followers/fans for your business who believe that you are offering valuable content which is really helpful to apply into their work or solving problems or meet goals. I would love to see how data points on how content mix plays a role in shares and amplication. Hi Raj, good points. If you download the report you will see we do look at content formats and their relationship to shares and links. We also looked at elements such as content length. Great read, Steve! This proves how important the role of content marketing is relative to what a content creator does. The former creates a sustainable way to sustain and increase content performance over time based on the factors of traffic and shares. And as you’ve said, this is done through amplification and monitoring. I am quite surprised that you didn’t mention the use of SumoMe Content Analytics to track the performance of the content – I think it is a valuable tool to help people gain insight into the content they are producing. The fact is that if the content were engaging, then it would get traffic and shares. Even these high quality sites make have seen some “article inflation” where the number of articles grow but the substance does not. However, we may be seeing a trend where people tend to share less since there is so much content out there overwhelming them. I guess it is important to describe something that people are interested in: some food recipes, cultural events or music influence. I think, this book can really help, thanks for sharing!